These photos came from two different European drum corps rehearsals last weekend. Carsten Bamberg of Woelper Loewen sent this photo and caption. This is a photo taken at the Woelper Loewen's first drill camp of the season during the Easter weekend. We had temperatures around 0 degrees and one thing was sure: We didn't need any sunscreen for this camp! Though it was quite tough, we made it through, and the members even had fun! Jaap van Waveren, tour director for Beatrix, sent this photo and caption. In 44 years, it has never been as cold as it was during our 2008 Easter camp. 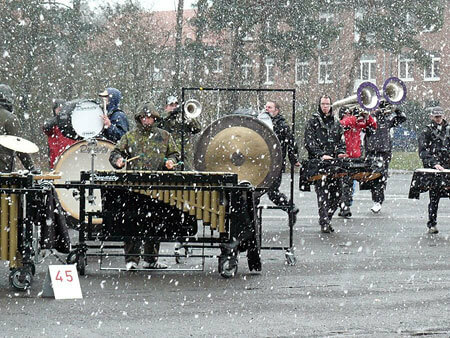 This is the corps removing snow from the field before rehearsal in Roggel, the Netherlands.